Speakin' Geek: When a poppy blossomed in a lighthouse. 'From Up on Poppy Hill'. This is a place where spiders go to retire and dreams bloom. Recently I came into the knowledge that there was a film festival going on around Ireland. A 'Japanese film festival'. I was blown away by the pedigree of talent on show. There were films based on video games, and unlike western films like 'Doom' or....'Resident Evil', they were given the proper respect to the source material. From what I have seen of 'Ace Attorney' there is respect, humour and over the top action, much like the 'DS' game it is based upon. 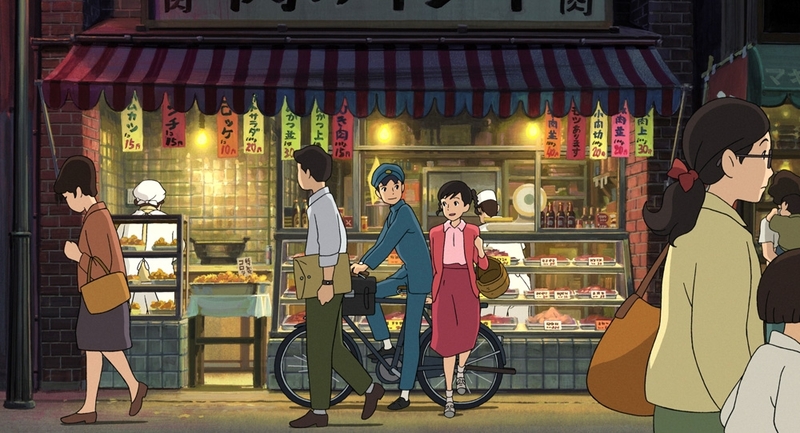 However I am not here to discuss 'Ace Attorney', though I do highly recommend it, I am here to talk about 'Up on Poppy Hill', another entry into the fantastic collection of 'Studio Ghibli'. 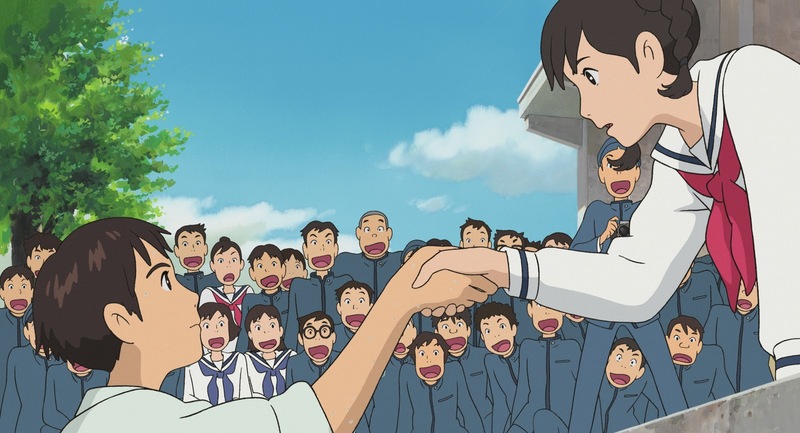 When I booked my tickets to see 'From Up On Poppy Hill' I had no idea what I was getting myself into. The experience at the 'Lighthouse Cinema', which until then I had never been to, was superb, the audience itself was filled with people discussing 'Bioshock' and 'Pokemon'. I was with my people and it was just fantastic. Today, as a celebration of seeing a 'Ghibli' film for the first time in the big screen I will review not only the film, but the whole experience. From the concession stand guy giving me his opinion on why the 'Lighthouse cinema' is superb to the manager of the cinema singing us the melody that represented the 1964 Olympic games that inspired this particular 'Ghibli' film. The lads are a bunch of gossips. As we all settled into our multi-coloured seats, I know, we were treated to a wonderful back-story by the manager of the 'Lighthouse Cinema'. 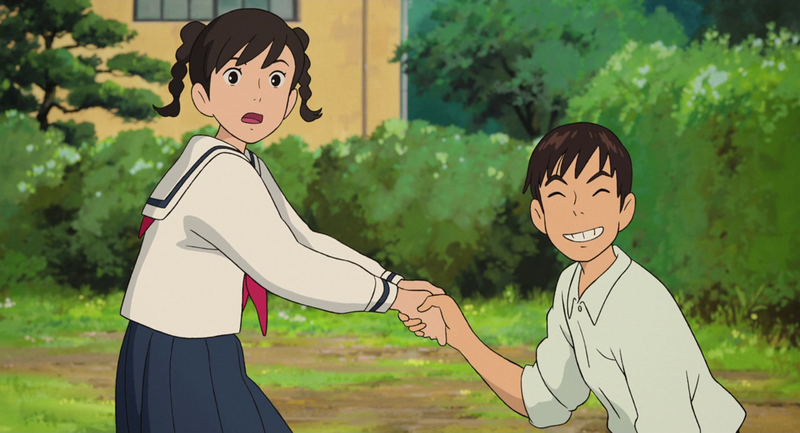 He explained that 'From Up on Poppy Hill' was a film about nostalgia, about simpler times and a loss of innocence. This was due in part to the 64' Olympic games in Japan, but it was also due to the modernization of Japan and all its cities for the Olympic games. 1964 was the year where everything changed in Japan, the bullet train construction, the eyes of the world were upon Japan and they had to impress. It was out with the old and and in with the new, and what this film shows is that is not always for the best. It is here that we are introduced to Umi, a high school student who, with her family are living through this era of change and handling as well as possible. Through Umi's eyes we see how this generation are far more respectful of the artifacts of yesteryear, and this is where a most unconventional battle is waged, by the students of the 'Quartier Latin'. Sarah Bolger, Irish born and raised is a fantastic actress, she brings such a warmth and tenderness to 'Umi'. Her journey through the film is superb, her heartache, her love, oozes from the screen. Anton Yelchin of 'Star Trek' fame is on top form as our other lead, 'Shun'. Charismatic, earnest and downright cool, he is the rebel with a cause that earns the ladies affections and the lads respect with his first "jaunt" on screen. Then there is the scenery, the picturesque view and setting that slowly gives way to "modernization" and you can see it in every scene where there is a cars engine discharging. It is a wonderful process that shows the passage of time and then there is the 'Quartier Latin', a structure that houses not only an eclectic group of misfits but also houses memories and that is what everyone is trying to preserve in this film, memories. The scenery jumps out and grabs your imagination and doesn't let go. Well I hate to do this, especially to a 'Ghibli' film, but there is a few problems. The main one that stuck out to me was the 'soap opera' style drama that plays out as the film progresses to it's end. The melodrama of the whole conflict did feel a bit forced and when it all plays out I hope that you'll also understand the problem. As an extension of this problem there is the level of communication that these characters possess, if they simply had sat down and talked their problems out a lot of the conflict in this film could have been averted. 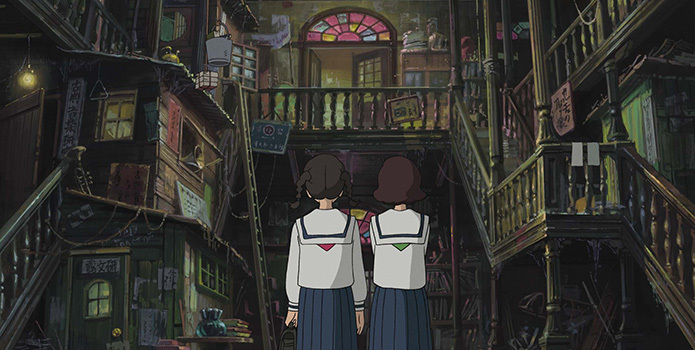 As one of the few 'Ghibli' films that has grounded itself in the real world it was given an unenviable task, and it has excelled with flying colours. The simple fact, when a film can make cleaning a manor a highlight of an already impressive film you know you're on to something, special.